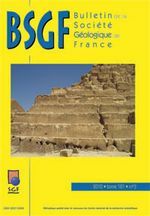 GASQUET D., BERTRAND J.-M., PAQUETTE J.-L., LEHMANN J., RATZOV G., DE ASCENÇÃO GUEDES R., TIEPOLO M., BOULLIER A.-M., SCAILLET S. and NOMADE S. – Miocene to Messinian deformation and hydrothermal activity in a pre-Alpine basement massif of the French western Alps: new U-Th-Pb and Argon ages from the Lauzière massif (8 figs, 5 tabl.). EL AZZOUZI M., MAURY R.C., BELLON H., YOUBI N., COTTEN J. and KHARBOUCH F. – Petrology and K-Ar chronology of the Neogene-Quaternary Middle Atlas basaltic province, Morocco (9 figs, 3 3 tabl.). REKHISS F., MGUIDICH S., OUALI J. et TURKI M. M. – Metamorphisme biphasé dans la série jurassico-crétacée du chaînon de Djédeida (Nord-Est tunisien) (12 figs). GARCIA G., AMICO S., FOURNIER F., THOUAND E. and VALENTIN X. – A new Titanosaur genus (Dinosauria, Sauropoda) from the Late Cretaceous of southern France and its paleobiogeographic implications (6 figs). RAYNAUD S., DE LA BOISSE H., MAHMOUD MAKROUM F. and BERTHO J. – Geological and topographical study of the original hills at the base of Fourth Dynasty Egyptian Monuments of the Memphite plateau (20 figs).